The ideas of the Socialist Party, based on scientific socialism, are identified with Karl Marx and 'Marxism', but Friedrich Engels deserves to be bracketed alongside the great 'philosopher of the millennium'. He not only sustained Marx by sacrificing his own energies to finance Marx's work, but also made a great contribution to their joint ideas on historical materialism, philosophy, economics and many other fields, which laid the foundations for the modern struggle for socialism. John Green, the author of this impressive book, is to be commended for bringing Engels, one of the greatest figures in human history, to life for modern readers. Green admits to drawing on Gustav Mayer's book from the 1930s, which is excellent on the life and works of Engels. However, the great merit of Green's book is that it 'fills in the gaps', particularly on the personality of Engels, his evolution and his relationship with Marx. In some respects, Engels anticipated Marx on the role of the working class and socialism. This was gained through his experience in England in particular, in the early 1840s, of the Chartist movement - the first independent movement of the working class historically. He was also at one with Marx in analysing the conditions in the factories and in the ideas of economics and philosophy, which are the cornerstones of Marxism. The Conditions of the Working Class in 1844 can help to illuminate even the problems of today's labour movement. It complements Marx's chapters on the working day in the first volume of Capital. Green brings to life how Marx and Engels, almost at the same time, evolved from acceptance of the idealist philosophy of their great teacher Hegel to the ideas of dialectical materialism. Indeed, Marx and Engels rescued 'dialectics' - the method of thought which seeks to understand the all-sided character of phenomena, first enunciated by the ancient Greeks - by refuting Hegel's idealism. They "turned Hegel upside down" and put him "from standing on his head firmly back on his feet". Hegel viewed the evolution of nature, humankind and social relations as based on the development of ideas. But Marx and Engels argued that ideas, consciousness, are expressions of material forces, which are the driving impulse of history. Their ideas, either consciously or unconsciously, are accepted by most conscientious analysts today. "It's the economy, stupid", was how Bill Clinton crudely put it in 1992. But it was Marx and Engels who first argued that the economy is the ultimate determinant of the 'political superstructure', the state, politics, etc. Today it is almost taken for granted. This does not mean that Marx and Engels had a crude determinist position. On the contrary, they analysed how the state - part of the political superstructure - both had an effect on and is, in turn, affected by the development of economic processes. Friedrich Engels also emerges from this book as one of the most human figures in the socialist and the genuine communist movement. He broke from his bourgeois background to place himself on the standpoint of the working class in his ideas. The author compares him to Che Guevara and there are some undoubted and striking similarities. Both were men of action who broke from their privileged backgrounds. They were true, both to themselves and also to economic and political processes they accepted, and were courageous. But there were big differences in their personalities and particularly the history of these two great figures. Che Guevara, at the time of his murder, had not freed himself completely from the caricature of Marxism purveyed by the world 'communist', in reality Stalinist, movement. He was, however, evolving through his own experiences towards a critique of the ideas of Stalinism and quasi-Stalinism. Engels, throughout his political life, could be considered a great theoretician as well as a fighter for working-class liberation. However, he and Che had one other thing in common: Engels participated in big battles in the 1848 revolution, commanding troops, and subsequently earning the nickname of 'the general' from Marx, his family and his comrades. 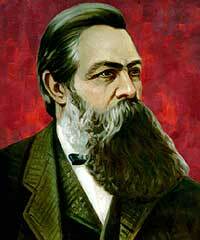 On a personal level also, Friedrich Engels was an admirable character. Not for him a forced marriage or relationships with women from his own privileged background. He defied the capitalist conventions of the time and his family to live with Mary Burns, who had a profound effect on him in relation to the national struggle in Ireland at the time. Engels showed concern and acted for people in difficulties in the émigré circles. Some of the most interesting parts of this book are of Marx and Engels' collaboration in the division of labour in the establishment of the International Workingmen's Association (IWA, 1864-1876) and subsequently the great Paris Commune of 1871. Because of his involvement in 'business', Engels did not take an official position in the IWA's work. Having a 'capitalist' involved in a body directed against capitalism itself would have provided ammunition for its enemies. But his influence and work was far-reaching and earned him the bitter opposition of the state. The German state led by Bismarck even deployed a small army of spies to check on and, if possible, to spoil the work of both Marx and Engels for the international workers' movement. Engels and Marx, as this book demonstrates, argued for decades for the political independence of the working class from the capitalists. This was the case even when they advocated tactical and 'critical' support for specific actions of the rising capitalists, for instance in the 1848 revolution. They fought for an independent party of the working class - in the case of Britain for almost 50 years. This is the same task which the Socialist Party, socialists, trade unionists and militant workers face today with the collapse of New Labour into an openly capitalist party. The difference is that now the timescale for the emergence of such a formation will be much shorter, as the examples of other countries' first steps show; the development of the Left Party in Germany, the coalition around SYRIZA in Greece, etc. Insisting upon the working class as the main agent of socialist change brought Marx and Engels into collision in the IWA with the anarchists led by Bakunin. Green is mistaken when he argues that Marx and Engels "seriously underestimated the role of the socially less-developed countries". Green accredits the support for Bakunin and the anarchists in countries like Spain and Italy at the time to the "too critical" attitude of Marx and Engels and an "over-concentration on economics". But the real reason why the anarchists found an echo in these countries was the character of the economy then, which was relatively undeveloped, with the prevalence of small-scale industry and, therefore, the lack of a large working class united by big industry. Engels' work and the careful nurturing of independent working-class parties in Europe saw results, particularly in Germany, where the Social-Democratic Party, emerged as the "strongest mass socialist party in the world". Green points out, "In the Reichstag in 1871 there were only two representatives of the party ... but by 1912, only 17 years after Engels' death, the party won 110 seats (out of a total of around 400) with 34.8% of the vote." After Engels' death, the absence of his influence was keenly felt. The leadership was incapable of consistently following his and Marx's method, and the mighty Social-Democratic Party was unprepared for the huge social convulsions of war and its aftermath. Consequently, the working class paid a huge price, including ultimately the destruction of the workers' organisations after Hitler came to power in 1933. Engels, as his history showed, was prepared for all kinds of changes in the situation confronting the workers' movement. Green is wrong when he repeats some of the legends about Engels' introduction to Class Struggles in France. He has been misread as arguing against 'barricades' - that is the organised resistance of the working class to the onslaught of armed capitalism ready to destroy democratic rights - because of the new situation confronting the workers' movement. This was interpreted by later renegades from Marxism, such as Kautsky, in a centrist and reformist fashion, of partial and piecemeal reforms alone as the method to achieve the goals of the workers' movement. On the contrary, as Trotsky and Lenin pointed out, Engels was dealing with one specific historical phase. Even his words are qualified, as Engels emphasised that the 'barricades' would be required at certain stages. Green criticises the Bolsheviks, who led the Russian Revolution, for seeming to conflict with Marx's ideas as to where a revolution would first occur. He writes: "We can't let them [Marx and Engels] off the hook entirely. It was, after all their ideas that laid the basis and made possible the building of communism as a force and led to the subsequent revolutions." On the contrary, the one-party totalitarian regime, Stalinism, that subsequently developed after the isolation of the Russian Revolution had nothing in common with Marx and Engels' ideas. The Bolsheviks were correct to begin the revolution in Russia - which was the weakest link in the chain of world capitalism, as Lenin put it - but they envisaged this as the overture to a world revolution. Only a successful revolution in an advanced industrial country could have been the salvation of the Russian Revolution. In isolation, Russia was doomed either to return to capitalism or see a deformed workers' state emerge, although the Bolsheviks never imagined that the monstrosity of Stalinism would arise. Marx and Engels could not foresee - nor could anybody - at the time they were formulating their ideas in the nineteenth century, how subsequent events could work out in all countries. What is valuable in this book, is not the latter chapters, but those which show the evolution of the ideas which provide the bedrock of Marxism, the tools with which to carve out a new socialist future for humankind. Friedrich Engels, a towering historical figure, should be saluted in his own right for great works such as Socialism: Utopian and Scientific, Anti-Dühring, The Peasant War in Germany, The Housing Question and many, many other contributions to socialist and Marxist thought. Engels fully recognised Marx as the more important in laying the foundations for ideas that will lead to a new socialist society in the future. But in his labours Marx was joined by Friedrich Engels, a great figure to inspire and educate the new layers of socialist fighters who are emerging. Socialist Books PO Box 24697, London E11 1YD. Cardiff West Socialist Party: How do Marxists analyse the world?